Underhill’s Precision “Specific Task” Nozzles with solid metal construction, deliver millions of soft uniform water droplets providing a rapid, yet gentle water application over a wide range of flow rates. 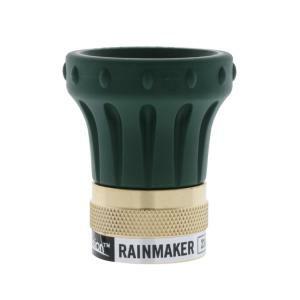 The Rainmaker is designed for syringe and spot watering turf and hardy landscaping. At 23 GPM flow rate, from soft watering to powerful drenching, the Rainmaker Precision nozzle is designed to fully irrigate without disturbing turf, dirt, seeds, etc…, providing a precise solution for hand watering applications.